Now, this third (and probably final) baby and first hypno-baby was born at home with the same midwife who attended the birth of our son two years ago. <3 I was 9 days overdue, but luckily had a midwife who firmly believed as I do that babies come when they’re ready, not on a specific timeline. I woke up that Sunday morning at 5 am to what I believed to be a practice wave. I had a lot of insomnia with this pregnancy and would frequently turn on my Hypnobabies tracks to relax and help settle down into sleep. I particularly enjoyed the Visualize Your Birth track and listened to it so frequently that I think it truly became a reality. I pictured giving birth in the mid-afternoon with the bright, happy sun shining through our wide windows in our bedroom while I breathed baby out calmly in the birthing pool. I noticed I was having practice waves every 15-20 minutes, but they weren’t uncomfortable. Just belly squeezes, like a big hug around my midsection. By 7 am they were 10 minutes apart and increased in intensity enough for me to know I was in my early birthing time. I listened to my Easy First Stage hypnosis track, then woke my husband up at 8 (who’d been sleeping next to me, oblivious to what was going on) and told him we’re having a baby today! Once I was standing up, the waves started coming every 5-10 minutes and were strong enough for me to want to lean over something. Either my husband or our daughter rubbed my back while I leaned over our bed (and the 2-year-old just stared at me wondering what’s up with mommy haha). I called my midwife and told her that today is the day, but that I’m not ready for my birthing team just yet as it’s early, and not starting as intensely as my first two precipitous labors did. We all came downstairs and got some breakfast. I ate and texted my mom and sisters, telling them to be on stand-by when things got closer. We watched some T.V. and enjoyed our last moments as a family of 4. In between my waves, I was playing and cuddling with the kids while joking around with my husband. My youngest sister showed up at 12pm and helped out with the kids and gave me some company/support while my husband wrangled with blowing up and filling the birthing pool. I really enjoyed using the “Peace” (hypnosis) cue during my waves, and did the finger drop technique (hypnosis cue) several times. I felt like maybe I’d made this up in my head, because I was in no pain, but could tell the intensity was starting to ratchet up. I felt shaky during my waves, like my blood sugar was low, so I ate some yogurt, pasta, chicken, and broccoli (can’t imagine not being allowed to eat or even drink in the hospital!!). The shakiness was still present during my waves, so I called my midwife and she said she wanted to come over. I went upstairs to lie down because I was feeling a bit tired. I had every intention of listening to some more Hypnobabies tracks, but by that point my mom, 2nd sister, and stepfather showed up. My midwife was surprised at how calm and quiet I was during my waves and even made a comment that I shouldn’t hold it in and that I might find doing some low moans might be helpful. I told her that I was comfortable but would definitely start making noise if I felt like it! I felt like my waves were slowing down now that I was in a reclined position in bed. I voiced my concern that maybe I’m not really in my birthing time right now, because I was feeling fine between my pressure waves, joking and laughing, playing with the kids, eating etc. I was frustrated that I’d been having these mild waves for 6 hours now, and with both my births prior, I’d already had my babies by now. Midwife offered to check me, and I accepted. I was comfortable with this since my waters hadn’t broken yet. I laid there and prayed that I was at least 3cm along. Midwife announced that I was 6cm dilated! This was certainly a morale boost for me, knowing I was more than halfway dilated with no pain! Midwife suggested that I go for a walk with my two sisters, which sounded lovely to me. I asked if I was allowed to go outside and she laughed and said of course, it’s a beautiful day. It was sunny and bright, and the weather was crisp but not cold. We went out and walked up the sidewalk. We didn’t even make it halfway up the sidewalk before I leaned over someone’s fence and “ahhh’d” through a pressure wave. At the peak of it, I remember very distinctly that I looked at my toes (in flip flops) and exclaimed in surprise at how pink my toes were! My sisters and I just laughed because they really were quite pink, and it was such a strange thing for me to focus on in such a moment. We walked a little further and joked about how odd this must all look to the people driving by. I had a couple very strong pressure waves for which I used my tallest sister to lean on for support. I decided it was time to head back home, even though it had literally only been 5 minutes. On the way back, I was still using my Peeeeaace cue with such great effect. Once the waves were over, I felt energized, happy, smiling, and full of jokes. I’ve never laughed so much while having a baby! At which point my midwife, her assistant midwife, her student midwife, my two sisters, and my husband all reassured me- validated my feelings, but reminded me how strong I am, how close I am to meeting this sweet baby and holding him or her in my arms. I listened to their words of encouragement throughout my transformation (transition) waves and felt myself opening and relaxing. It was such a beautiful moment of vulnerability—I felt completely surrounded by love and peace. I began involuntarily grunting again and I felt baby begin to descend past my cervix. I looked up at my midwife, with her gloves on and waiting for one of my waves to pass so she could check me and told her never mind, I was pushing haha. She smiled and said yes, you are! My sister captured a moment with her camera that I love— my husband holding my hand and using his other hand on my shoulder while using the “relax” cue. It really helped me settle into this next phase of birth! One of my fears going into this was that I would tear again, I’ve never torn on my perineum, but I can say that recovering from labial tears was so difficult for me, and my 2nd born tore my left labia so much that I had to have it surgically repaired one year later. So, during this pregnancy I’d done a lot of research on preventing tears and came across an old video on YouTube with Ina May Gaskin talking about this subject, saying that a huge factor in preventing tears is when a mother has her hands “down there” touching herself. It helps promote blood flow, helps control crowning too fast etc. I personally had been too squeamish and modest to do any of that with my prior births, but I was so past that at this point, and was in a safe environment with such loving people present. So, with the next wave, I reached my hand down to feel for crowning and to protect my tissues where I felt I needed it. I became so internally focused on getting this baby down. I can only describe this last pushing part as an out of body experience in reverse. It was the most amazing feeling, and I’m sure there was A LOT of oxytocin flowing, because I literally felt euphoric and almost high. No pain. It wasn’t even “intense,” it was just primitive and beautiful and fearless now that I’d voiced and cleared my fears earlier. I heard my midwife gently remind me to breathe baby down, and it felt amazing to do this rather than grunting, yelling, or any form of purple pushing. I could feel baby’s soft, velvety head crowning slowly with each breath. I felt a painless stretching and then a pop feeling as baby’s head came completely out. My midwife had me sit back off my knees and lean against the wall of the pool. I was grinning from ear to ear, because I knew the “hardest” part was over. I knew that I was just one or two pushes away from holding my baby. My sister later told me that she literally didn’t know that I’d been pushing at that point— I do remember seeing her face looking shocked after I’d re-positioned, and she could see baby’s head was out! With just two short pushes, one shoulder released, then the other, then our baby was born and immediately placed into my arms. Every mother knows this moment, the feeling of holding your baby for the first time and hearing those precious first cries. From the time we’d returned home to the time baby was born was just ELEVEN MINUTES. 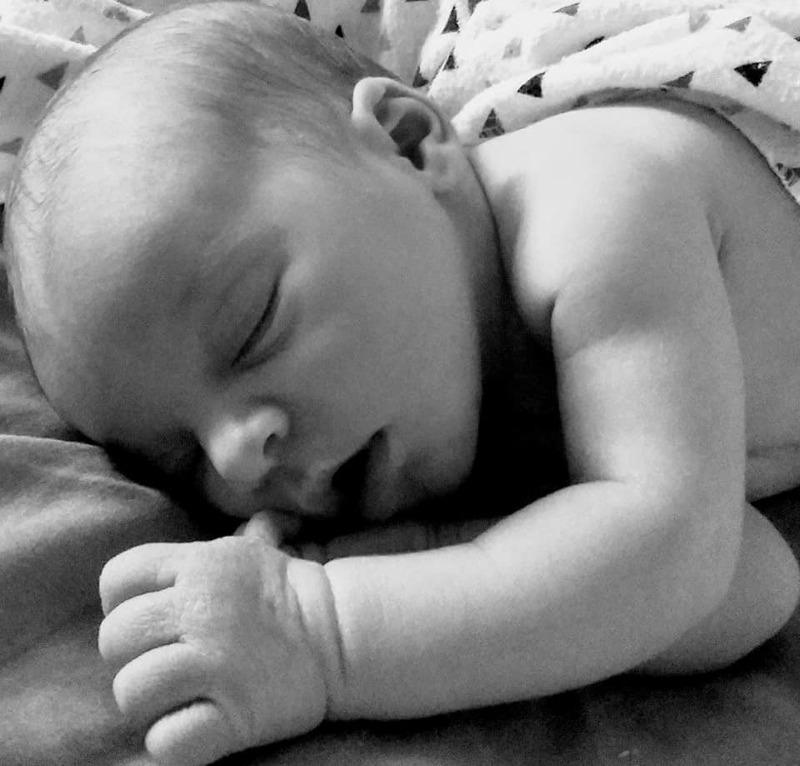 The first thing I said once I came out of my trance of meeting this baby was “Oh my God, that was so EASY!” Everyone laughed, and my midwife asked if I wanted to see whether I’d had a girl or a boy. I’d been so fixated on making sure baby was okay, that I forgot we were on team green. 😉 I lifted one leg and exclaimed, “It’s a girl!!! I knew you were a girl!” I looked up and saw one of my sisters crying tears of joy (this was the first birth she’d seen, and I’m so glad that I was able to show her what birth SHOULD be), and my husband’s face melting into a tender expression from knowing we’d had another sweet baby girl. The following moments are all a blur— getting up to the birthing stool to deliver the placenta, my 6-year-old daughter coming into the room to discover and meet her baby sister, then she cut the cord! I got washed up and into comfortable clothing and settled into bed. Midwife checked me and NO TEARS! 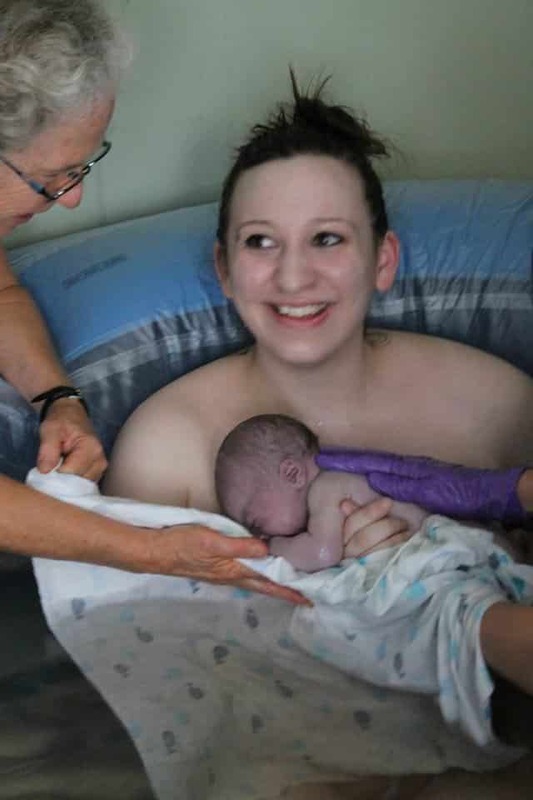 Baby girl nursed like a champ for a full hour after she was born. We named her Molly Anne and are SO in love. Hypnobabies is EVERYTHING. I didn’t even use the tracks exactly as intended, but they sneaked into my subconscious and completely took away any fear I had. I recently looked back on the birth stories I’d written on my first two children, and noticed such an emphasis on pain, just getting through it, fighting it. This time I expected intensity and allowed myself to surrender to my body, and that made all the difference! I can truly say I had a pain-free experience. It was a beautiful, peaceful, happy birth— with so much joy, love, and laughter throughout the whole time, and I have Hypnobabies to thank! !